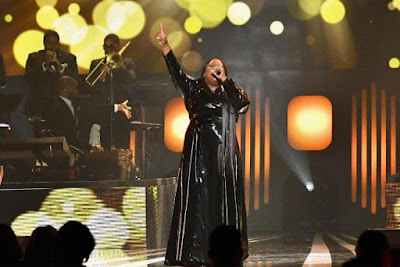 On the heels of a successful Stellar Awards weekend in Las Vegas, NV, Motown Gospel celebrates four wins for Tasha Cobbs Leonard, one of the most popular artists in gospel music. Cobbs Leonard earned top honors for CD of the Year, as well as Female Vocalist of the Year and Contemporary Female Vocalist of the year. Her chart-topping album, Heart. Passion. Pursuit. was also recognized for Recorded Music Packaging of the Year, as designed by Derek Blanks. On the awards program, Tasha Cobbs Leonard delivered a powerful performance of her hit single, “I’m Getting Ready.” The anthem, which debuted at #1 on Billboard’s Hot Gospel Tracks chart, has continued to gain momentum since Cobbs Leonard performed it on Good Morning America at the top of 2018, and is currently in the Top 15 at radio. New Artist of the Year nominee Gene Moore made his Stellars stage debut, performing his new single, “Coming Home,” as part of the new Emerging Artists stage. The song, headed to gospel radio this week, is the feel-good follow-up to Moore’s popular debut single, “Recover,” which he also performed during the Stellar Gospel Radio Awards & Showcase earlier that day. Stellar-nominated artists Brian Courtney Wilson and Lexi were also featured presenters on this year’s awards program. Both were in Las Vegas promoting new music—Wilson’s album, A Great Work, and Lexi’s debut single, “In The Room,” were both released on Friday, March 23rd. As a precursor to the main awards show, Motown Gospel again partnered with performing rights organization ASCAP to host its annual Morning Glory Breakfast. This year’s event, hosted by Lashawn “Big Shiz” Daniels, featured rousing performances by Kenny Lattimore (whose Christmas album, released by Motown Gospel, was nominated in the Special Event CD of Year category), Lexi and Brian Courtney Wilson, and remarks were made by newly appointed Motown Gospel Co-Executive Directors Monica Coates and EJ Gaines. The Stellar Awards telecast will premiere on TV One this Friday, March 30 at 9 p.m. ET/8 p.m. CT, and in broadcast syndication on 130 stations in more than 110 markets around the country between March 31st and May 6th.